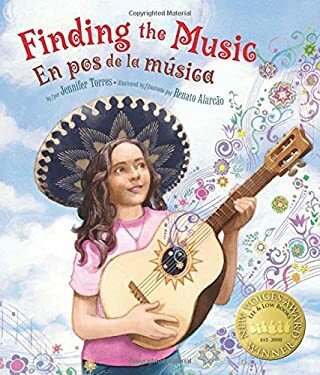 When Reyna accidentally breaks Abuelito's vihuela --a small guitar-like instrument--she ventures out into the neighborhood determined to find someone who can help her repair it. No one can fix the vihuela, but along the way Reyna gathers stories and mementos of Abuelito and his music. Still determined, Reyna visits the music store, where the owner gives her a recording of Abuelito's music and promises that they can fix the vihuela together. Reyna realizes how much she's learned about Abuelito, his influence in the community, and the power of his music. She returns to her family's restaurant to share Abuelito's gifts with Mama and is happier still finally to hear the sweet sounds of Abuelito's music for herself. With lively illustrations by Renato Alarcão, the tradition of mariachi music comes to life in this bilingual story. Winner of Lee & Low's New Voices Award, Finding the Music is a heartwarming tale of family, community, and the music that brings them all together. Used Very Good (4 available) Former Library book. Great condition for a used book! Minimal wear. 100% Money Back Guarantee. Shipped to over one million happy customers. Your purchase benefits world literacy!